Celebrated surgeons and those regarded as ‘experts’ in their field all have one thing in common; they are continually learning and adapting, expanding their knowledge and skills. Medicine is an evolving landscape, with surgeons at the forefront of innovative technologies continuing to push the bar higher. Spine Connection’s leading surgeons in Thailand and Germany are the perfect example. 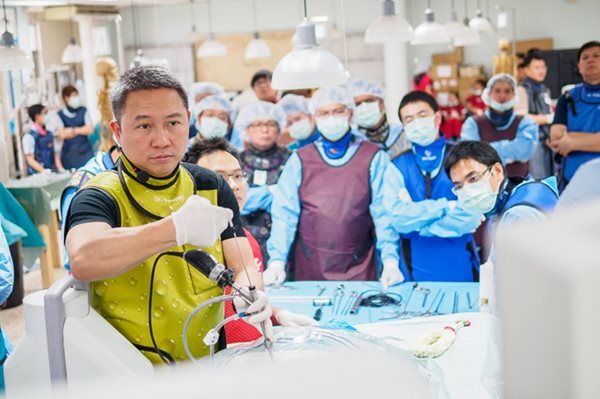 Bumrungrad International Hospital and St. Anna Hospital in Herne, Germany recently organized their annual workshop on Endoscopic Lumbar and Cervical Spine Surgery, at Bumrungrad Hospital in Bangkok, Thailand. The focus was to demonstrate the latest surgical techniques for back disorders such as lumbar disc herniation. Lumbar disc herniation is a common problem, causing significant pain and mobility problems with stabbing and throbbing pain that radiates down the legs. Disc herniations require removal of the disc or portions of the disc. Dr. Verapan and Dr. Withawin from Bumrungrad Spine Institute demonstrating minimally invasive surgery techniques. Back surgeries for many degenerative ‘wear and tear’ spinal conditions are on the rise, brought on by the ageing population, increase in obesity, and environmental influences such as the younger generation’s chronic use of electronic devices, forcing unnatural and prolonged spine positions. Increased hours of desk sitting and sedentary lives also lead to weak muscles that adversely affect the spine. Past techniques used for spinal surgeries included open spinal discectomy that required bigger incisions that damaged muscle and ligaments near the spine. Scarring and recurrent pain are two consequences of these more aggressive procedures. Dr. Sebastian Ruetten, one of the workshop’s experts, invented an endoscope (a hollow tube that allows for camera visualization and insertion of small instruments) that allows a minimally invasive surgery which avoids the long-term effects and complications of traditional surgery. Dr. Sebastian Ruetten is a highly respected German surgeon and Head of the Department of Spine Surgery and Pain Therapy at St. Anna Hospital in Germany. The procedure involves an endoscope being inserted through a very small (7.9 mm) incision. St. Anna Hospital of Germany and The Bumrungrad Spine Institute jointly organize full endoscopic lumbar and cervical spine surgery symposiums three times a year, twice in Germany and once at the Bumrungrad Spine Institute in Thailand. This full-endoscopic spine and cervical surgical technique has become widely accepted by spine surgeons around the world. 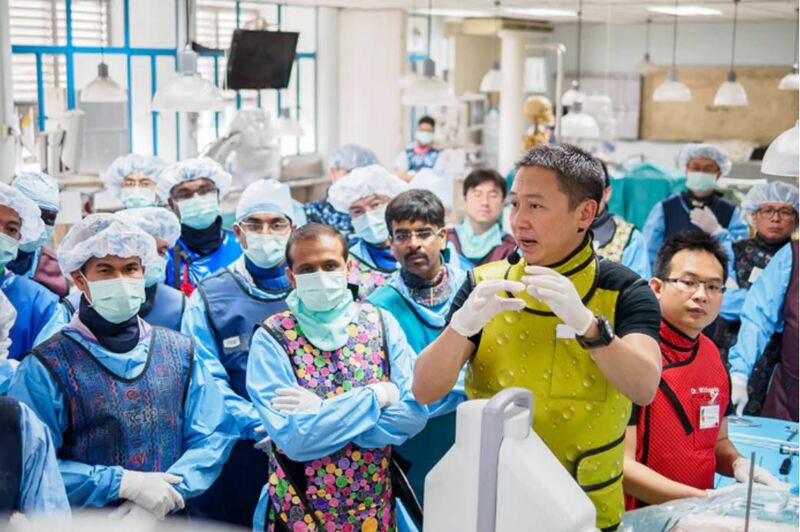 Bumrungrad Spine Institute headed by director Dr. Verapan Kuansongtham has been selected by Dr. Ruetten as Asia-Pacific’s first and only training center for endoscopic surgery. The very best surgeons are constantly learning, and travel overseas for workshops to master new techniques from ‘experts’ in that area. Instead of using an operating microscope, the endoscope allows clearer visualization for micro-discectomy procedures with the ability to look at the anatomy in a panoramic view rather than from a distance that occurs with the operating microscope. Discs can bulge and press on spinal nerves in a variety of configurations which makes the endoscope more valuable due to the range of angles (20 to 90 degrees) that permit better visualization of all relevant anatomy. Because the incisions are smaller with the endoscope, patients benefit from less trauma, bleeding, infections, scarring, and generally faster healing. The economic and pain-reducing benefits of faster recoveries are an enormous benefit to the hospitals, doctors, and patients. Standard endoscopic surgical techniques were first used as treatment of lumbar disc herniations. With new advances in optical technology as well as endoscopic surgical techniques, other spinal disorders can be treated with less risk. Some of these procedures include decompression of vertebral stenosis of the lumbar, thoracic, and cervical spine including the treatment of bone spurs and slipped vertebra. The ongoing workshops in Bumrungrad Hospital are attended by surgeons from all over the world. Half of the participants are Thai, while the remaining attendees are from the United States, Europe, Australia, New Zealand, Brazil, Nigeria, Japan, Korea, Hong Kong, Taiwan, Malaysia, the Philippines, Vietnam, China, Iran, and India. In 2017, and increase in operating tables was needed to accommodate extra surgeons who attended didactic lectures, hands on organ donation (cadaveric) training, and surgical observation. The endoscopic spine workshops now include percutaneous (keyhole) spine fusion TLIF surgeries, and grow in size every year. In fact, after mastering the techniques at the training center in Thailand, a group of Chinese surgeons have now preformed this surgery on hundreds of patients in China. 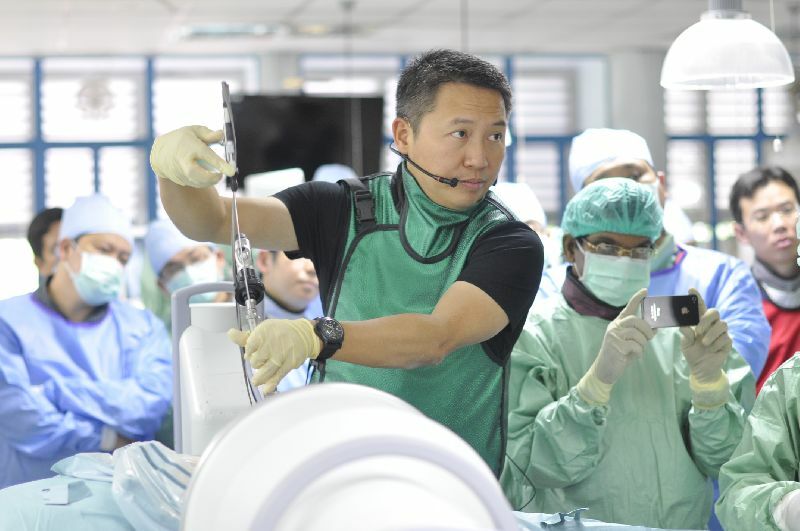 A training course has now been established in China, with surgeons from Bumrungrad Spine Institute as lead instructors. New developments between Bumrungrad Spine Institute and Dr. Ruetten in conjunction with Richard Wolf GmbH, a leading medical instrument manufacturer in Germany, include the launching of their own larger endoscope. Using a 10.5 mm endoscope; this larger endoscope can remove larger bone fragments in spinal stenosis surgeries thus stabilizing the spine more efficiently.